I am just getting around to blogging about what was an overall great wedding reception for Mr. and Mrs. Scott and Tiffany Schreiner. The reception was held last Saturday, August 8th, in the Olive Anne Gallery at the Beech Activity Center in Wichita. The Olive Anne Gallery was dressed to the hilt and looked incredible. It was a very personal and fun night with a definite MJ and Barbie flare to it! 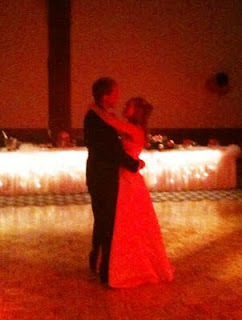 Scott & Tiffany - you two were a great couple to work with and thanks for letting us be a part in your awesome reception! - Good luck!